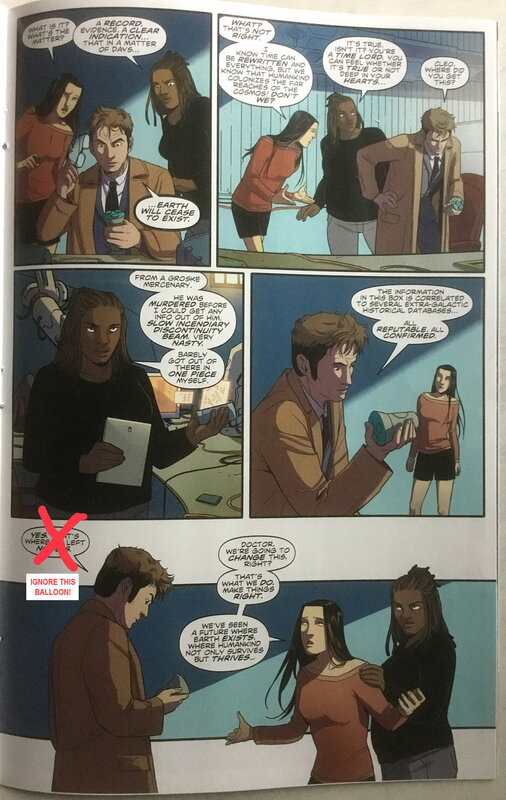 If you’ve bought a copy of Doctor Who – The Tenth Doctor Adventures #3.11 (out today, 22nd Nov. 2017), you’ll notice that page 14 is missing dialogue. The page, as it’s intended to be read, is below. It’s an unfortunate printing glitch of some kind, and I’m sorry it’s happened. Hopefully, dear and much appreciated reader, it won’t impair your enjoyment of the story too much. This error will, I’m assured, be corrected for any future collections and already has been for the digital edition of this issue. But, before you get to page 14, let me also warn you about page 21. In the final panel of this page, there’s a balloon that shouldn’t be there. I don’t know why or how it is – it’s from an earlier draft of this script and, despite being deleted on two occasions, somehow it’s crept back in to the final production files. So, I implore you, don’t read that balloon! Pretend it isn’t there! In this context, what the Doctor’s saying is nonsensical anyway (even more than usual) but I really don’t want it to be a spoiler for what follows in episode 2 of this story. Unfortunately, glitches in production and printing sometimes occur. On the10D title all of us – myself, editors and production staff – operate as tight a net as humanly possible to prevent stuff like this happening. On this occasion, the net wasn’t tight enough. Apologies if it messes with your reading experience. I hope you know, by now, that nothing is more important to me than that – your support and interest in the Doctor Who stories our team makes is appreciated more than I can say. And I hope you’ll stick around to see how this final story of Year 3 plays out – it’ll be worth it…!